Transparent transistors and circuits have been successfully fabricated using nanowires of indium oxide or zinc oxide. "The nanowires themselves are transparent, the contacts we put on them are transparent and the glass or plastic substrate is transparent," said David Janes, a researcher at Purdue University's Birck Nanotechnology Center and a professor in the School of Electrical and Computer Engineering. "Our study demonstrates that nanowire electronics can be fully transparent, as well as flexible, while maintaining high performance levels," said Tobin J. Marks, the Vladimir N. Ipatieff Professor of Chemistry at Northwestern. "This opens the door to entirely new technologies for high-performance transparent flexible displays." 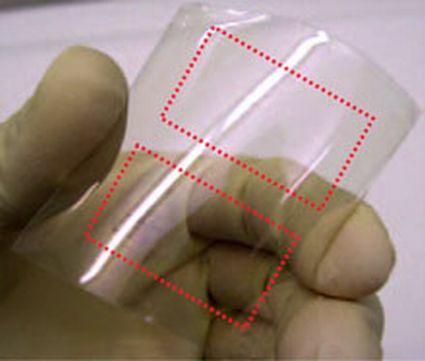 Large-scale transparent displays on curved surfaces. She set up a screen: a television that unrolled like a poster. Flexible electronics for RFID tags, contactless credit cards and other electronics applications embedded on flexible surfaces. How else am I going to get a sleeve watch, not to mention readout skin? The nanowires are transparent because they are made of materials that do not absorb light in the visible range of the spectrum. In conventional electronics, transistors are connected to the rest of the circuitry by tiny lines of metal that act as wires. But in the new approach, the nanowires are the transistors. "This is a different kind of wire," Janes said. "It is basically taking the place of the silicon in silicon electronics... Ideally, we want to have circuitry where each pixel [in a display] has a drive transistor and then some control transistors with it so that you can turn your pixels on and off," Janes said.